In the cardiac conduction system, electrical signals arise from the sinoatrial node spontaneously and travel to the atrioventricular node through the atria. After a brief pause, the stimulus is conducted from the AV node through the bundle of His to the ventricular Purkinje fibers through the left and right bundle branches. The SA node is located at the junction of the right atrium and superior vena cava, with blood supply coming from the right coronary artery in 55% of patients and the left circumflex artery in 45% of patients . It is the dominant pacemaker and maintains a rate between 60-90 bpm in most adults. Disease of the SA node, such as in sinus arrest or sinoatrial exit block, the SA node fails to create an impulse and no atrial contraction is produced. Sick sinus syndrome and Bradycardia-Tachycardia syndrome are examples of SA node disease. When the SA or AV node fails to generate a spontaneous impulse, other myocardial tissue can assume the role, such as an atrial, junctional or ventricular focus. The AV node is located within the interatrial septum, with blood supply coming from the RCA in 90% of patients and the LCA in 10% of patients . The AV node has a slower intrinsic rate of 40-60 bpm. Disease of the AV node can occur at different locations within and below the AV node, and can cause characteristic blocks such as 1st, 2nd and 3rd degree AV blocks. The location of the block will determine what escape rhythm is produced, such as junctional or ventricular. In most cases, if the block occurs within the AV node, a junctional escape rhythm is produced with a rate between 40-60 bpm, which creates a narrow QRS complex . If the block occurs below the AV node, a ventricular escape rhythm is produced with a rate between 20-40 bpm creating a wide QRS complex . A left and right bundle branch block will also cause unsynchronized ventricular contraction, with widening of the QRS complex and create characteristic changes on an electrocardiogram. The AV node terminates at the bundle of His, which splits into the left and right bundle branches in the interventricular septum. The left bundle branch is short and splits into the left anterior and posterior fascicle. The posterior fascicle has dual blood supply and is particularly resistant to ischemic damage. The left and right bundle branches taper out to produce numerous Purkinje fibers which stimulate myocardial contraction. Disease of these fascicles and bundle branches can lead to a left or right bundle branch block, left anterior or posterior fascicular block, bifascicular block or a trifascicular block. Sinus arrest/block and sinoatrial exit block- Sinus node dysfunction, SA node misses one or more cycles. This missed cycle or pause may induce an escape response. Sick sinus syndrome and Bradycardia-Tachycardia syndrome are examples . AV Blocks- Blocks that delay or prevent atrial impulses from reaching the ventricles. A 1st degree AV block and 2nd degree type 1 Wenckebach are usually caused by impaired conduction within the AV node, while a 2nd degree Mobitz type 2 is caused by impaired conduction just below the AV node. A 3rd degree AV block is caused by a complete block of conduction within or below the AV node . 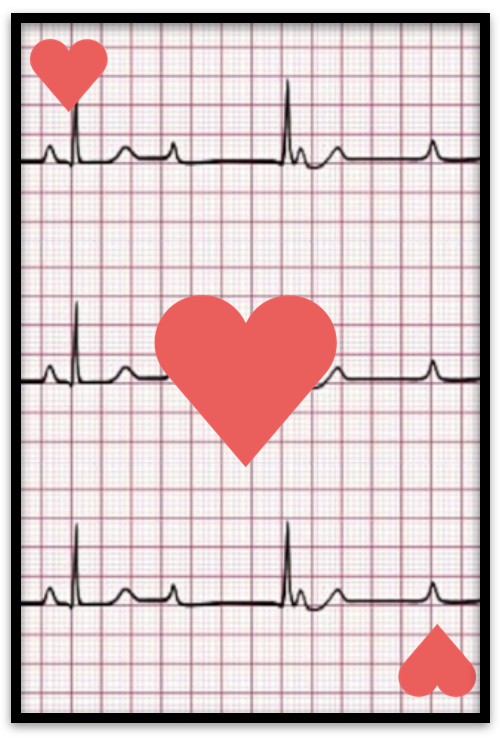 1st degree AV block- Prolonged PR interval greater than 0.2 seconds or one large square . 2nd degree Mobitz type 1, Wenckebach- Progressive prolongation of the PR interval with a non-conducted p wave, no ventricular conduction . 2nd degree Mobitz type 2- Intermittent non-conducted P waves without PR interval prolongation, with regular and constant P waves . 2nd degree high grade AV block- P:QRS ratio of 3:1 or higher producing an extremely slow ventricular rate . 3rd degree AV block- Complete dissociation between atrial and ventricular contraction, no association between P waves and QRS complexes .